The AC-9 was one of two Southern Pacific Railroad's articulated steam locomotive class that ran smokebox forward after 1920. 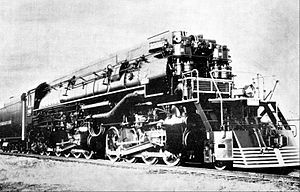 Twelve AC-9 class locomotives were built by Lima in 1939 and were Southern Pacific's largest and heaviest steam engines, partly a consequence of low quality coal these engines were designed to burn. The AC-9s were partially streamlined (the only articulated steam engines to be so equipped), having "skyline casings" inspired by Lima's GS series of 4-8-4's, also made for Southern Pacific, and were equipped with coal tenders, unlike the cab forwards. The wheel arrangement was 2-8-8-4, which was nicknamed "Yellowstone". Between 1939 and 1952, all the twelve AC-9 engines were in service between Tucumcari, New Mexico, El Paso, Texas, and Tucson, Arizona, where they mainly pulled freight trains and occasionally also passenger trains such as the Golden State Limited. In 1952, they were converted to burn oil instead of coal, and moved to Southern Pacific's Modoc line between Sparks, Nevada, and Alturas, California, where they worked in freight service from 1953 until retirement in 1956. No AC-9 engine has been preserved. This Project for the SP AC-9 is unique because it contains an extra chuff in voice 2, this allows the chuff sounds to vary and they may not be in sync with the front cylinders. In addition special whistles and a horn have been added. Chuff sounds vary with load (volts) and peak speed (delay and volume) Air pump sounds vary (pitch) depending on the air need.